Sierra Leone is a place where soccer predominates, yet at three tennis courts in Freetown the sport of tennis has begun to take hold. Under the direction of two dedicated coaches, Amidu and Ziggy, a small and growing group of children to have become passionate about learning how to play tennis. 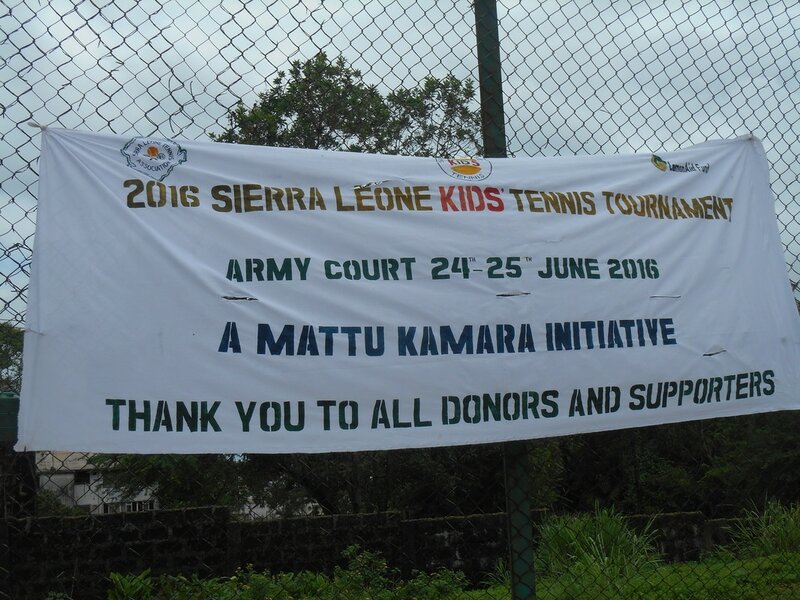 LemonAid Fund has long been involved with children and tennis in Sierra Leone. A generous donor sent over 20 light weight rackets and LemonAid Fund bought Ziggy a stringer machine as part of a micro-finance business. Sarah Johnston, an education and training consultant, has served as a LemonAid Fund champion for Sierra Leone Kids Tennis (SLKT). Sarah was inspired by watching Amidu work patiently with a number of aspiring tennis champs. She saw Alfred, 8 years old, hitting balls with great zeal as Amidu coached "small, small". Alfred's home is near the Liberian border but because of the war he now lives in Freetown with his uncle who is a hotel cook. On the other side of the court, Balu, who is 15 and has represented Sierra Leone in tennis tournaments, was hitting up with 11 year old Johnie whose shoes are broken and racquet in need of restringing. Nonetheless, he was whacking the ball back and forth with great vigour. Then there was Musaba, 12 years, who was enthusiastically volleying the ball with a warped racquet with broken strings. Every day when there is no school, these kids and others head to the court to earn some money to help their families as ball boys, or in Balu's case to partner adult players who need an opponent. When the court is free, there is time for the kids get in a bit of practice and coaching. They are making lemonade and with a little LemonAid Fund help we can change their future. The coaches would like to have the more equipment for the kids in Freetown (racquets, balls, grips), money to improve the courts they play on, and support to run tennis clinics for 8-12 year olds in Kono, Bo, and Kenema. Amidu, one of the coaches, is a 29 year old Sierra Leonean who gives his time to work with boys and girls from all walks of life, teaching and encouraging them to play, have fun, build their skills and learn the ethics of the sport and life. He is keen to make a difference in his country, to build tennis and to take his skills to children who have never seen tennis in the war torn areas of Sierra Leone. In 2011, Amidu was elected National coach in part because he has become known through his efforts with SLKT. LemonAid Fund was front and center at the first national tournament, watching one of the SLKT players who has begun to compete - and win - internationally. In 2014 Mattu Kamara, the number one under 14 Sierra Leone Tennis Women's player, comes to the US and then receives a 4 year scholarship to a tennis school in Thailand. Who knows where she may go in life thanks to Champions Sarah and Mark Johnston and the Reinhardt family. Mattu is doing well in Thailand educationally, socially and in tennis. In the summer of 2016, Mattu returned to Sierra Leone during her summer break and helped to fundraise and organize a tournament to give back some of what she has gotten. Mattu at Robbie Wagner's Tournament Training Center in the US summer of 2014 thanks to Robbie Wagner and Kathy Reinhardt.